A social media giant Twitter rolls out broadcast live video feature from its apps on Thursday. The company stated that people can now experience live video on Twitter powered by Periscope. People around the world used to go on Twitter to see what is happening around the world. People around the world are following celebrities to check out their daily tweets about their life. Twitter rolls out this feature just a few weeks after rival Instagram launched live streaming video feature. User doing a tweet can now tap the "LIVE" button which then pops up a pre-broadcast screen. User can then frame their shot and can press "Go Live" to start broadcasting. 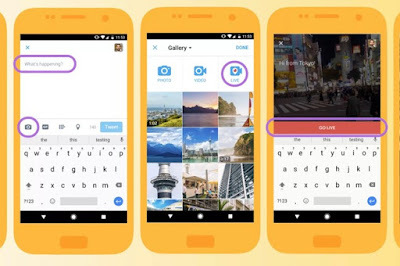 Users are now able to create and tweet a live video stream directly from the Twitter app. Whenever you are live anyone can join your broadcast, can comment and send support in the form of hearts. User can also search Live videos in the Twitter app, Periscope app and it also can be embedded on others sites. To end your live video, simply swipe down and tap the "End video" button. One can have option to receive push notifications from account you follow when they go live. Twitter's live video feature is rolling out to everyone on iOS and Android. If you are running previous version of the app then you have to update app to utilize this live video feature of Twitter.